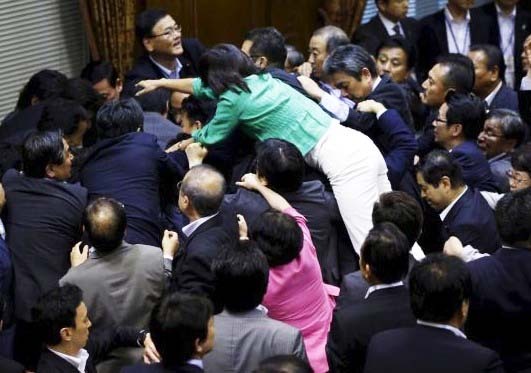 A law that would change Japans pacifist character, lead to a violent brawl inside the Parliament. 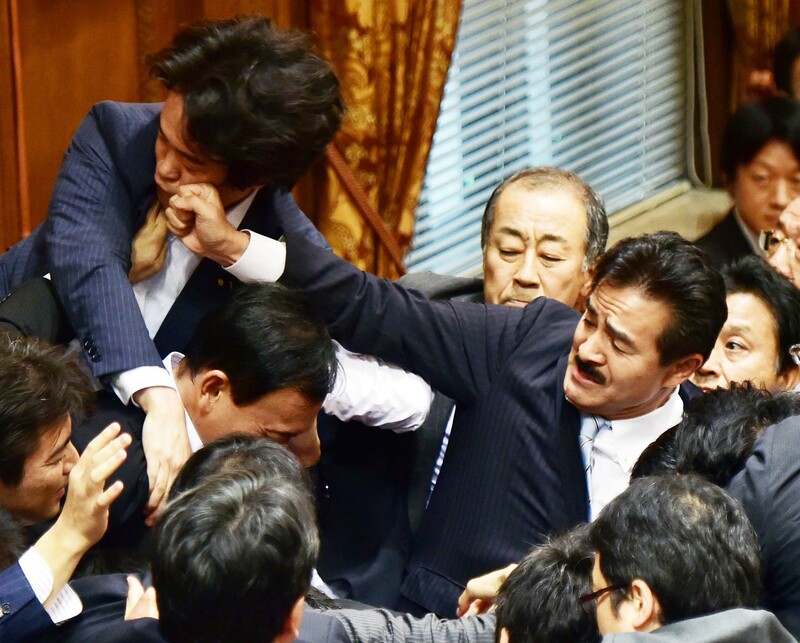 MPs push and shove each other during a heated debate as 13,000 rally outside Tokyo’s parliament against proposed change to law. 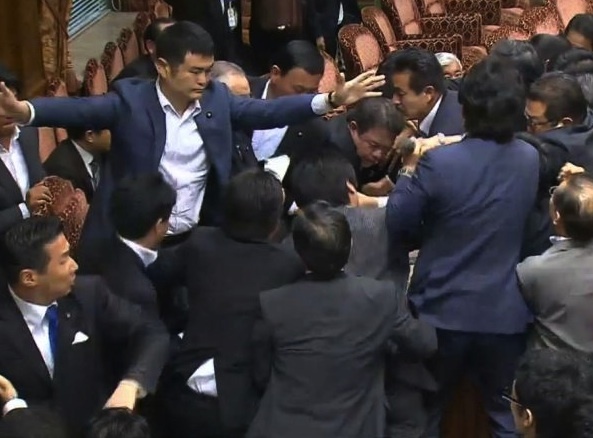 Japanese politicians scuffled on Thursday during a heated debate over a security bill that could see the military fight abroad for the first time in decades, after thousands rallied to voice their anger. 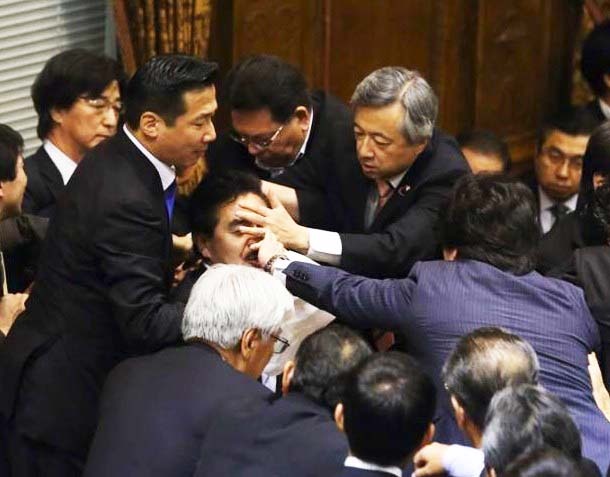 This Japaneese politician tries to come on top of the problem. This guy is calling for a political time-out. Tensions fan high after the committee vote was repeatedly delayed over Wednesday night, as opposition MPs blocked doorways and packed the corridors of parliament in protest. Under the planned changes, the military – known as the self-defence forces – would have the option of going into battle to protect allies such as the United States even if there was no direct threat to Japan or its people. Although the constitution, which bars troops from taking part in combat except in pure self-defence, was imposed by US occupiers, many Japanese feel strongly a change in the law would alter the country’s pacifist character. These are the men who is supposed to work for peace in Asia. The elite of Japan. The Bible explains there will be chaos and panic everywhere, just before Jesus the Messiah returns. Everywhere also includes the offices of power. Those who believe in humanism will find it difficult to explain why all these wise men seems to have lost their mind. Jesus the Messiah is truth. He said there in nothing, absolutely nothing good inside a man. After seeing these photos: If you continue believing in humanism, you are a fool. Let God be truth, and all men liars. If you were a Syrian, you would most likely desire to run away. If you had the money, you would surely. For the Syrians, this is not about fighting ISIL. This is about 10 different armed groups fighting and slaughtering each other. The majority of them Islamic by nature. This manslaugther is being funded by the US and EU. The west support a crimial massmurder, similar to what we saw in World War I. Sensless masskillings in a small area, some few square kilometers of populated land not covered by desert. Russia and Iran support the Syrian government, which these 10 groups also wants to fight. The US being the most doublefaced of them all, trying to fight both ISIL and the Syrian goverment. There is only one word that can give justice to the situation: MADNESS. Madness truly defines the citation. This is completely false. This is a cover up of the true masterminds of ISIS and Al Nusra. ISIS is born from the Former Regime Elements of Saddam, and from the Feddayin Saddam. Then it has been filled with Jihadists released from the Assad’s jails and with Assad’s intelligence’s assets. Then it arrived Putin with his FSB/GRU controlled Caucasian Jihadists, for the extreme cruelty in order to influx the Western public opinion. It will add trouble to the China pot (you forgot to point out, I suppose).